I love it when Victor watches cooking shows. He can actually be a lot more adventurous than me. 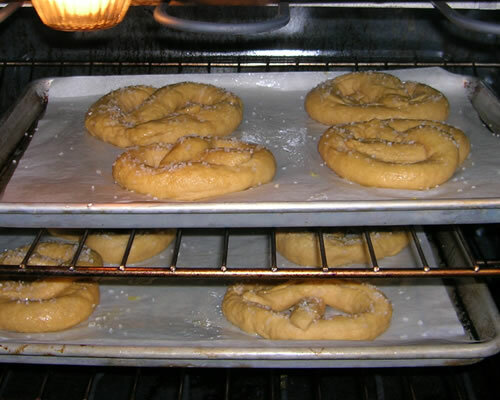 I’ll dismiss something out-of-hand, where he will actually give an idea a fair shake – like today’s pretzels. He printed off the recipe and off to the kitchen he went. Less than 10 minutes later, I hear a shriek of despair. Warily treading into the kitchen, I see Victor, sobbing. We had no flour! I couldn’t believe it. We always have flour in the house. I start going through the cabinets, myself. We had half a bag of self-rising flour (which wouldn’t do at all) and half a bag of King Arthur White Whole Wheat. 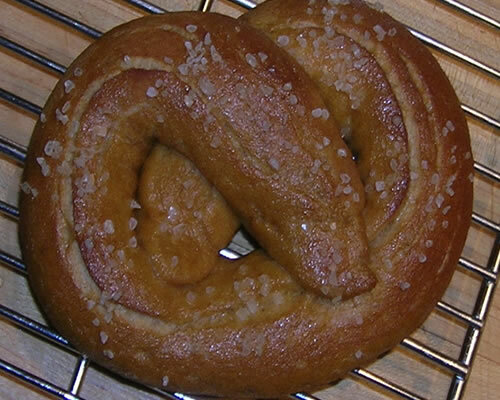 We decided that white whole wheat would make perfect pretzels. Crisis averted (and note to self to buy flour tomorrow)! The recipe is very straight-forward and really quite easy. The weather was perfect and we put the dough out in the back yard to quickly proof. 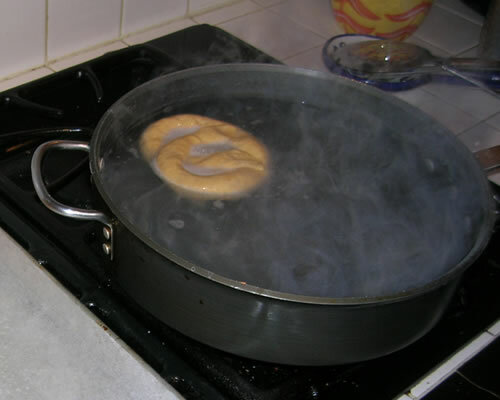 After rolling and forming, they went – one at a time – into the boiling water. 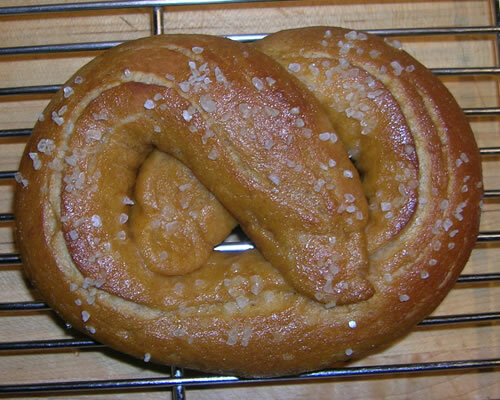 Our “pretzel salt” was actually “San Francisco Bay Salt” from – you guessed it – San Francisco. I remember the huge salt ponds in the bay when I was a kid growing up. It’s a really large crystal and the perfect size for the pretzel. I had mine with a sweet and spicy mustard, Victor stayed with traditional yellow. Now… these are not exactly diet-foods but at about 200 calories each, they’re doable in moderation! I froze half of them to lower the temptation factor!